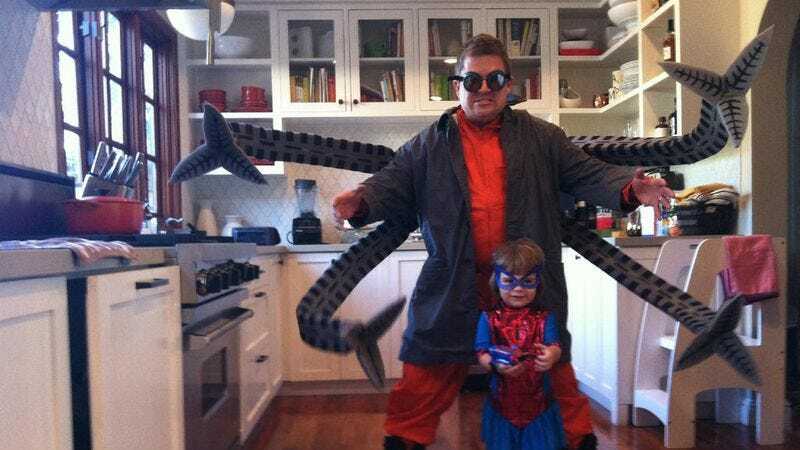 Last night, Patton Oswalt tweeted a photo of his elaborate Doctor Octopus costume, and yes, it's awesome. You probably already follow our favorite comedian on Twitter, but in case you don't, there it is. And with his daughter as Spider Girl, as well. Nerds unite! ETA: A reader pointed us to this video of Mythbusters’ Adam Savage explaining how he made Oswalt’s lightweight, flexible costume. It took Savage a mere four hours to create, which means if you start now, you might be able to finish your own Doc Ock costume by next Halloween.